Shutdown Solution? None To Be Seen Yet, But Sides Will Talk : The Two-Way The impasse continues. Meanwhile, parts of the federal government remain closed. Among the latest developments: President Obama has invited leaders of both parties to a Wednesday evening meeting at the White House. The Lincoln Memorial is officially closed. National parks and monuments are among the parts of the federal government affected by the shutdown. Even as word emerged Wednesday that Democrats and Republicans would at least speak with each other, there weren't any real signs of a solution. As NPR's Mara Liasson said on Morning Edition, there was "no escape hatch." Republicans, Mara said, say they'll only agree to fully fund government operations if the new health care law ("Obamacare") is either defunded, delayed or otherwise denuded. Democrats, Mara added, "aren't in the mood to rescue the Republicans from the box they've got themselves in." As the day began, no negotiations were scheduled between the White House and Congress. In the late morning, though, there was an announcement by the White House and a spokesman for House Speaker John Boehner, R-Ohio, that the president had asked congressional leaders to come to the White House for a 5:30 p.m ET meeting. Whether the scheduling of a meeting was significant, however, was far from certain. Brendan Buck, Boehner's spokesman, released a statement saying that "it's unclear why we'd be having this meeting if it's not meant to be a start to serious talks between the two parties." But the White House, according to NPR's Scott Horsley, said Obama will tell the congressional leaders the same thing he's said in recent days: that he wants the government re-opened with a "clean" piece of legislation that doesn't touch Obamacare and that he wants them to then get about the business of raising the government's debt limit before Uncle Sam runs out of borrowing authority on Oct. 17. Scott reported earlier about how, "beyond the shutdown, there's a bigger battle brewing" over the federal debt ceiling. -- Obama's trip. The White House announced early Wednesday that because of the shutdown President Obama is at least shortening a long-planned trip to Asia. He's set to leave Saturday for what was to be a four-nation, week-long tour. But the last two stops — Malaysia and the Philippines — have been canceled, the White House says. As of now, Obama will visit only Indonesia and Brunei. -- Partial funding? Late Tuesday, Republican leaders in the House "sought passage of legislation aimed at reopening small slices of the government," The Associated Press writes. "The bills covered the national parks, the Veterans Affairs Department and city services in Washington, D.C., such as garbage collection funded with local tax revenues. "The move presented Democrats with politically challenging votes but they rejected the idea, saying it was unfair to pick winners and losers as federal employees worked without a guarantee of getting paid and the effects of the partial shutdown rippled through the country and the economy. The White House promised a veto. Since the measures were brought before the House under expedited procedures requiring a two-thirds vote to pass, House Democrats scuttled them." As NPR's Tamara Keith reported on Morning Edition, Republican Sen. Ted Cruz of Texas is getting some of the credit for the idea of trying to pass bills that "keep small popular pieces of the government open." To that end, Wednesday evening, the House passed three of these bills, funding the National Parks Service, the District of Columbia and the National Institutes of Health. "The bills are part of the House Republican plan to pass spending bills in areas where there is bipartisan agreement in order to spare some pieces of the government from the shutdown. "But while Democrats support these priorities, they mostly opposed attempts to pass them in the House. Democrats said Republicans were using the bills as part of a political strategy to mitigate the effects of the shutdown when they should instead pass a Senate spending resolution that funds the entire government." 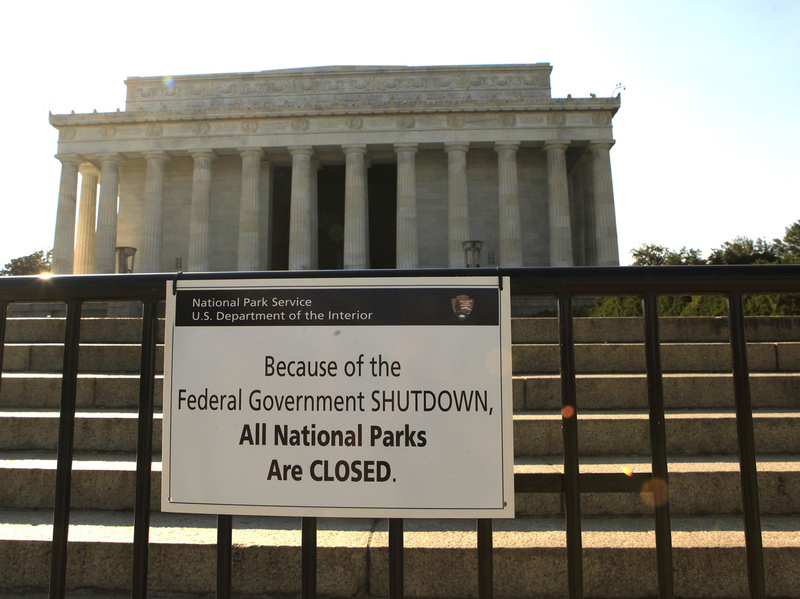 The partial shutdown began as Sept. 30 turned into Oct. 1. Here's how long it's been going on.